Chana Dal is another of the regularly made lentil dish in my house. Also known as Bengal gram, chana dal is nothing but split black chana (chickpeas) with the husk removed. When this lentil is powdered we get the gram flour or besan. 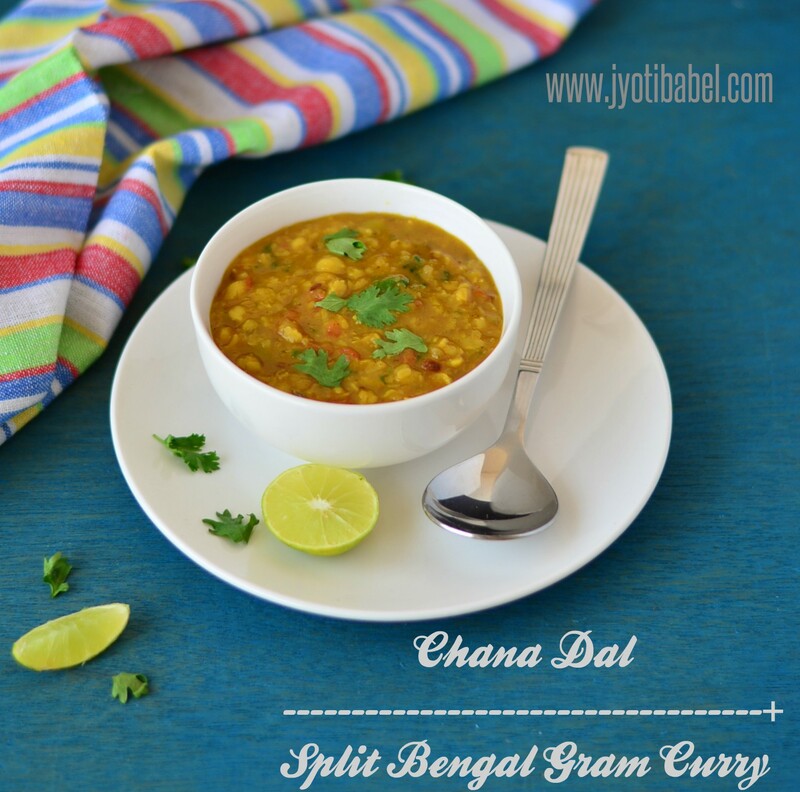 The recipe for chana dal/ split Bengal gram curry is quite simple. The only thing to make sure is that you should soak the dal at least an hour or so, for it to be cooked properly. Also, the texture of this dish is not smooth. Some of the grains of the lentil should retain its shape. So, be sure to not overcook it. It is a nutritious dish and goes well with plain or jeera rice. It can also be served as a side dish along with the main course. 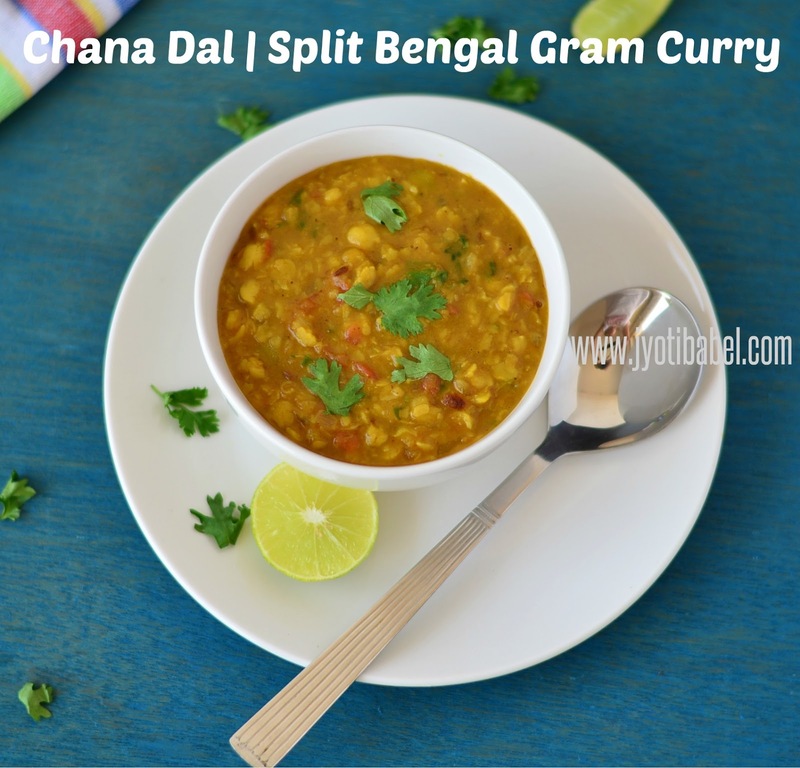 Let's check out the recipe for chana dal/ split Bengal gram curry now. 1. Wash and rinse the dal with water 2-3 times before soaking it in fresh water for at least an hour. 2. Take a pressure cooker (3 litres capacity is good), add the soaked dal (discard the water it was soaked in), salt, turmeric powder, and add 2 cups of water. 4. In a pan/ kadhai, heat the oil. Once the oil is heated through, add the bay leaves, asafetida, and cumin seeds, garlic and slit green chilli. Add the chopped onions and saute it till they are translucent. Add tomatoes and capsicum and cooked them covered till the tomatoes are soft and mushy. Add red chilli powder, amchur and garam masala and stir. 5. Now add the cooked chana dal into the pan and stir well. Let it simmer on medium heat for 5 minutes. Take it off the gas. Add coriander leaves. Add lemon juice if you like and serve hot with rice or as a side along with the main course. This Chana Dal/Split Bengal Gram Curry Recipe is my entry for BM 88 Week 2 Day #2 under the theme 'Dazzling Dals'. For day#1 I had posted Restaurant Style Dal Tadka. Chana dal looks simply fabulous. What an eye pleasing dish. Am sure this dal tastes extremely delicious when served along with rotis na. That is a comforting bowl of dal. This is such a tasty side dish for rice and rotis. Love such simple recipes.. Adding capsicum to the chana dal is new to me. Should try sometime. Dals are my go-to comfort food. Channa dal is my favourite among all dal recipes. Beautiful presentation Jyoti. Ultimate comfort food. Will pair well with roti as well as rice. Whenever I run out of ideas what sort of dal or kadhi to make.. chana dal always comes to my rescue. Its so easy to make and comforting with some parathas. Fantastic dish and the picture looks out of the world, so neat and well presented! Chana dal adds so much flavor, it is my favorite among all dals. The dal looks great, love the simplicity of the recipe. we never make dal with channa dal..........will definitely try thsi one out........ours is usually toor dal or moong! lovely presentation..........neat! My favorite dal is chana dal and I love it with some hot chapatis. Protein packed dal recipe, good with rice plate.